Multi Purpose Dive Reel features, hands free line deployment, no trigger or squeeze handle to operate, corrosion proof construction, no backlash or tangles, 150 ft. floating polypropylene line. 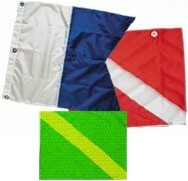 This flag and float assembly breaks down for easy transport. 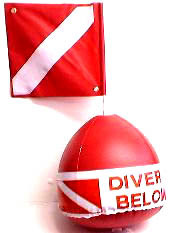 Styrofoam ball with lead weight on one end and diver down flag on the other. A plastic clip keeps the flag attached in a stiff wind, plus you can tie it down. Designed not to tip over when being pulled. 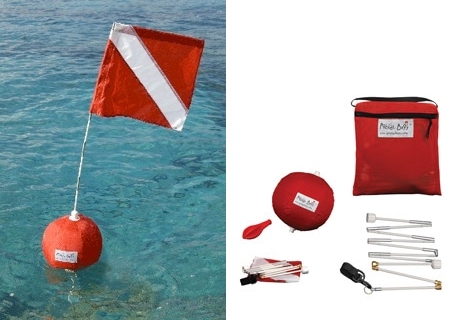 Tired of having to find room for a bulky flag and float with all your other gear? 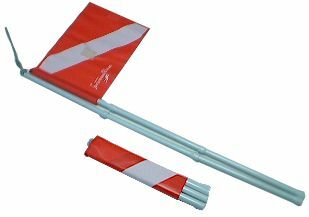 Going on a trip and looking for a compact way to take a flag and float? 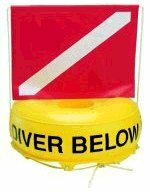 The pocket buoy is for you! 3 lb lead recommended for fresh water, 5 lb for salt water.